Minister for Planning stresses on devising holistic strategy for developing infrastructure. 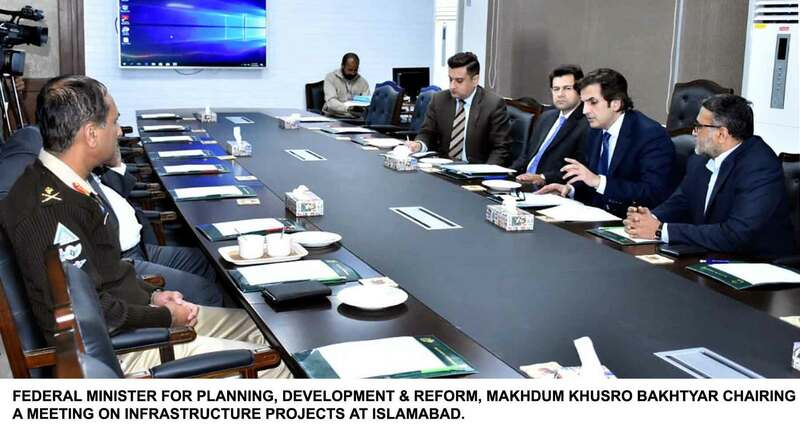 ISLAMABAD, November, 2018: Federal Minister for Planning, Development & Reform Makhdum khusro Bakhtyar has emphasised the need for devising a holistic strategy for developing and upgrading infrastructure across the country and fill connectivity gaps for sustained national growth. The Minister was chairing a meeting to discuss and review infrastructure projects under CPEC framework, PSDP funded projects and identify innovative funding mechanisms to finance the infrastructure projects here at Islamabad. Secretary Planning Zafar Hasan, Secretary Communication Shoaib Ahmad Siddiqui, DG National Logistics Cell Maj. Gen. Asim Iqbal, Engineer-in- Chief of Pakistan Army Lt. Gen. Muhammad Afzal, Chairman NHA Jawad Rafique Malik, Member Infrastructure Malik Ahmed Khan and senior officials of the Ministry were also present in the meeting. The Minister said that Ministry of Planning is in the process of finalising the 12th Five Year Plan and there is a need to set priorities on how to go about developing infrastructure under an effective planning. The Minister called for making concerted efforts to find innovative ways of financing infrastructure projects in view of limited fiscal space for implementation of projects through PSDP. There is a need to explore innovative funding options like Public Private Partnership (PPP) or Build Operate Transfer (BOT) mode in the transport and logistics sector, stated the Minister. ‘This will relieve burden on PSDP and also facilitate provision of adequate funds for the ongoing infrastructure projects for their timely completion’, said the Minister. The Minister also stressed on finding ways for generating revenue by utilising existing asset base for financing and effective implementation projects pertaining to roads and highways. During the meeting, Chairman NHA gave a briefing on various ongoing infrastructure projects including multiple routes under CPEC framework.